Baked bread is always considered a good breakfast option, but wasn’t an attractive breakfast alternative for hospital patients. In 1894, while looking for a more digestible breakfast, Kellogg accidentally discovered crispy wheat flakes. He experimented the technique on corn and perfected the formula over the time for not just hospital patients but for everyone looking for a healthy breakfast. Kellogg wasn’t a scientist or a marketing person, then how do you think he created a product that turned out to be a bestseller. He worked on an actual problem, he was a design thinker. You shouldn’t confuse design thinking with only DESIGN, but it’s about rethinking every aspect of the PRODUCT existence. Yes, you read it right, design related cognitive thinking can be applied to redefine anything. In the past, innovators have applied design thinking to build a needle-free vaccine to rethink airport security checkpoints experience to even creating a better Pringle. An innovative way of thinking where design principles are applied to create a solution that meets the real needs of customers. 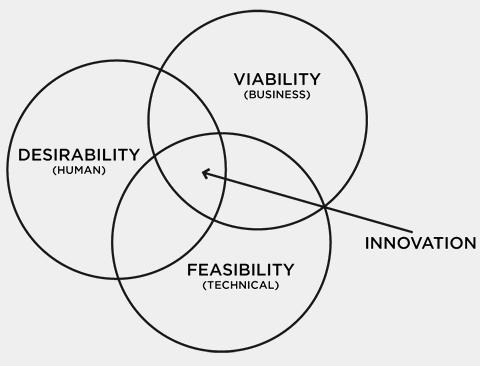 It has been around for ages, but the term first came to limelight through Richard Buchanan’s 1992 article, “Wicked problems in design thinking.” However, its current form is courtesy the FATHERS of design thinking… err IDEO, David Kelley and Tim Brown. In simple terms, it means stepping out of your comfort zone and apply visual thinking, creativity, and innovation to find out of box solutions. It questions our assumptions and challenges our thinking. Design thinking innovations can be successfully applied within any industry whether it’s a small or large scale companies and in varied domains such as government, healthcare, financial services, nonprofits and much more. Empathize is the starting point and demands research to learn about the audience that’s going to use the product, what they do, say, think and feel, what motivate or discourage them and where they experience frustration. Define is when you dig deeper into the issue by combining knowledge gained during empathy. This is when you organize your observations to establish the common pain points, find out the actual user needs and highlighting opportunities for innovation. Ideate is the step when you gather your team and brainstorm as many crazy and creative ideas as possible, addressing the human needs identified in the define phase. Prototype is created to weigh the impact and feasibility of ideas and making continuous improvements based on the received feedback. Test involves putting your prototype in front of real customers for feedback to verify if the designed solution meets user’ needs and if it has improved how users feel, think or can help them with their tasks. Implement involves putting your vision into effect, ensuring your solution is materialized and touching the lives of your end users. Whoa! That’s a lot. So, why is it getting so popular? The main advantage here is that user is not the center of the process, but HUMAN is. If you are wondering how a user is different from Human. If you are wondering how a user is different from a human. A user is a subset of Human, and in design thinking, you are not learning about your users just for your product and observing only what’s required for it. But analyzing a big picture of their lives by shadowing them to find actual problems they face in their daily lives. In turn, the design elements are not there for decoration, but to tackle actual user needs and challenges. An empathetic design approach that doesn’t involve individual opinion, but multidisciplinary teams brainstorming the human needs and coming with the solution together, build a product and work on the feedback, so it carries their collective expertise. The combination of rapid prototyping and quick feedback creates a product that solves real problems and in turn valued by users. Creativity is the backbone of design thinking, encouraging involved folks to explore an idea completely. It boosts communication between teams, group sharing and exchange of ideas. Brainstorming, experimenting, and risk taking help you in arriving at a creative solution, thus paving the way for innovation. The innovator in you can refocus time and efforts on the right things/features people are actually looking for. It helps you in adapting to the environment of constant change and getting stuck on one monotonous path. You need no such tools to get started with design thinking, just a little bit of EMPATHY and an EAR that listens and a BRAIN to think freely without being judgemental. But you can even help yourself with a few REAL WORLD tools to make design thinking process a breeze in your agency. Mind mapping software can help your team brainstorm and sift through potential ideas. While a project management tool will keep entire team involved and informed about project progress, communication tools to build an active interaction among all people involved. You might also need a strong technical platform like Github, when you are working on different versions of your project in collaboration with a team of developers. While UX was struggling to find a way to enter company’s alleys, design thinking has reserved a prestigious boardroom entry. We have really high expectations from our experiences in current times, but this increases the complexity. Design thinking is a simple approach to problem solving, increasing the chances of getting an innovative breakthrough in how UX is getting adopted in the interfaces.